I’m posting early today because I have these shots that I processed late last night that I truly love. 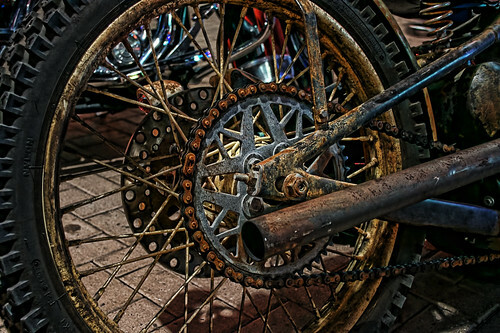 When we were at Bike Night on Thursday, we were surrounded by gorgeous, shiny, powerful machinery with lots of chrome and highly polished surfaces. And in the middle of all that bling, we found THIS bike. 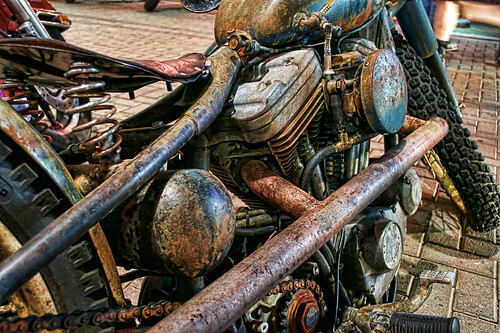 It looks like it might have been buried in someone’s barn or possibly under a sand dune for years…or maybe it belonged to Mad Max. Anyway, the grunge bike looked like the perfect candidate for some HDR treatment, but since I was shooting in a low-light situation without a tripod, I was doing good to get a single exposure, much less a bracketed series. So, I used Topaz software to create an HDR effect. First I used Topaz DeNoise to clean up the digital noise speckles in the photo. Then I used Topaz Adjust, playing with the presets and sliders to get just the right amount of detail and color saturation. Finally, I used the Paintshop Pro X3 Curves tool to tweak the exposure, then the Sharpen tool to define the edges. Be sure to click on the images to view them large on black…it’s worth the extra click! 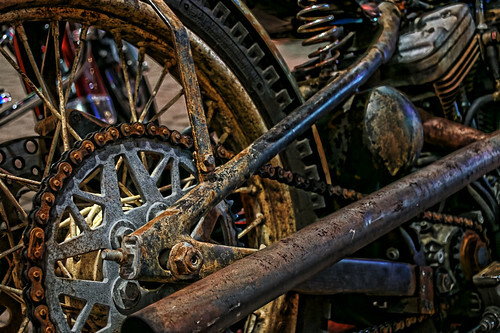 This entry was posted in Processing, Shooting and tagged Arizona, AZ, Bike Night, camera, D5000, Glendale, grunge, HDR, Mad Max, motorcycle, night, Nikon, old, Paint Shop Pro, photography, software, Topaz, tripod, Westgate. Bookmark the permalink.